Park your car in Leverock's parking lot and catch the water taxi over to Rum Bay Restaurant. This 20 minute, $6, ride through the intercoastal, to the Palm Island Resort will bring you to the Rum Bay docks and it's just a short walk on the boardwalk through the mangroves to Rum Bay. The Water Taxi starts running at 11:30 am from behind Leverocks and runs approximately every half hour to the island until 6:30 pm. Rum Bay Restaurant does not take reservations for parties less than 8 people. However, reservations for the water taxi for parties of any size are recommended. Please call 941.697.0566 to reserve. Click here to check out the menu and specials! Don Pedro and Palm Island are one of the last non-commercialized barrier islands in southwest Florida. Today the island is primarily a residential and vacation community. Palm Island resort on the northern end of the island is a private resort for guests only. 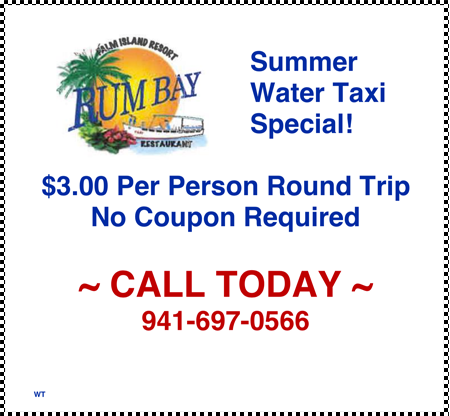 We do offer a Water Taxi service for those of you who would like to enjoy Rum Bay Restaurant. You can call Rum Bay Restaurant to make reservations for the Taxi which leaves from behind Leverocks Restaurant for a 15 min cruise to the dock for Rum Bay. You are not allowed to bring beach equipment on the Water Taxi or make use of the beach while at the Resort. The restaurant does not take reservations for parties less than 8 people. However, reservations for the water taxi for parties of any size are recommended. Please call 941.697.0566 to reserve. Down island there are a couple of public beaches, but there are no public facilities on the island, and dogs are not allowed on the beach. There are no shops on the island other than the gift store located by Rum Bay in the resort. It is a place meant for year-round residents and vacationers. Sunset & Nature Cruises	- Call	Debbie Curtis @ 941-697-4800 to set up a cruise - group rates available!